This entry was posted in 1900-1929, 1930-1949, 1950-1960s, Patient List. Bookmark the permalink. Post a comment or leave a trackback: Trackback URL. Looking for my Grandmother who was Wasalisia Haakanson or Phyllis Haakanson. She was from Kodiak and died at Morningside Hospital in the 1950’s. We do not know where she was buried. Her maiden name was Shugak. She did not speak too much english, she was aleut. Baptized as Russian Orthodox. My mother told me that someone there would transcribe letters from her to their family. Any information you may have about her or where she was laid to rest we would like to know. thank you. We will be looking for and scanning Wasalisia’s death certificate in the very near future and will let you know what we find out. I looked in the oregon death records and found a Wasalisia Haakanson, Date of Death 1/19/1954 at Multnomah, husband Arthur. I’ve also looked in the Oregon Metro Cemetery list and did not find her. So maybe she was buried somewhere else. 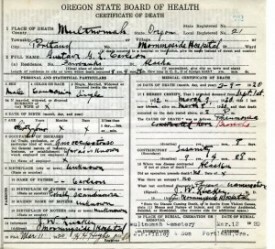 I would contact the Oregon vital records and request a detailed or original death certificate, which should indicate mortuary and place of burial. Hope that helps. I am trying to trck down my dads great aunt. She was from Minto, Alaska or, Mentasta, Alaska. Her name was Lucy Sam. Any info would be appreciated.